January 2016 Employee of the Month! We asked Andrea to answer a few questions about YES. Here's what she told us. 1. How did you find out about YES? Through Orbit. 2. 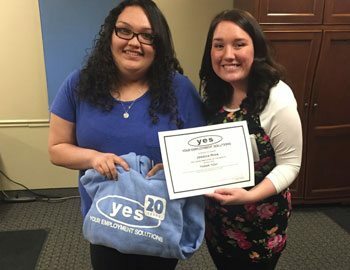 Whats been your favorite job through YES? Tech support. 3. What do you think would make YES better? More permanent placement/direct hire opportunities. 4. What would you tell someone looking into working with YES? Your Employment Solutions is a great place to find jobs! Andrea was awarded a thank-you certificate and YES hoodie for her great work. Thanks again Andrea for being a part of the hard-working Utah staffing team at Your Employment Solutions! We asked Graham to answer a few questions about YES. Here's what he told us. 1. How did you find out about YES? Online. 2. 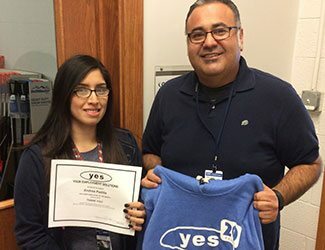 Whats been your favorite job through YES? Lifetime. 3. What do you think would make YES better? No complaints! 4. What would you tell someone looking into working with YES? Just walk in and do it. Graham was awarded a thank-you certificate and YES hoodie for his great work. Thanks again Graham for being a part of the hard-working Utah staffing team at Your Employment Solutions! We asked Taulau to answer a few questions about YES. Here's what he told us. 1. How did you find out about YES? A friend told me about your staffing company. 2. 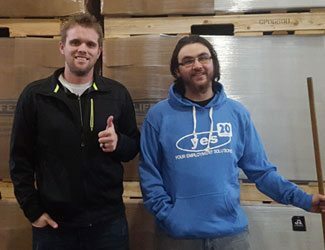 Whats been your favorite job through YES? This is my first assignment. 3. What do you think would make YES better? Help more people find work. 4. What would you tell someone looking into working with YES? Be confident. Don’t be lazy and do what ya gotta do. 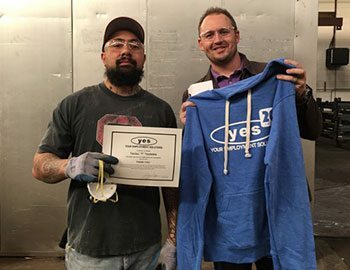 Taulau was awarded a thank-you certificate and YES hoodie for his great work. Thanks again Taulau for being a part of the hard-working Utah staffing team at Your Employment Solutions! We asked Jessica to answer a few questions about YES. Here's what she told us. 1. How did you find out about YES? My relatives told me about your employment agency. 2. Whats been your favorite job through YES? Customer service because of the great pay and commission structure. 4. What would you tell someone looking into working with YES? They are a great staffing agency to work for with great people! Jessica was awarded a thank-you certificate and YES hoodie for her great work. Thanks again Jessica for being a part of the hard-working Logan, Utah staffing team at Your Employment Solutions!